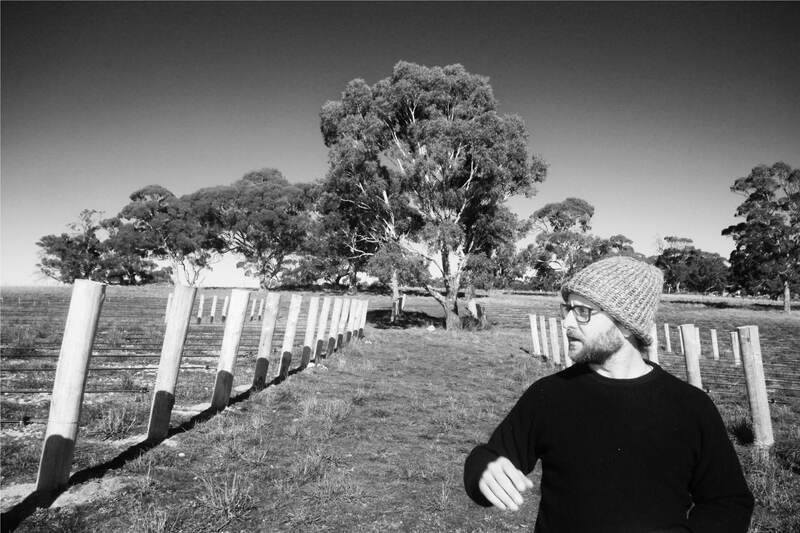 Tom Shobbrook makes wines at Seppeltsfield, in the Barossa Valley. Natural wines, made by hand from organic and biodynamically grown fruit. “A 9 hectare vineyard nestled in our little valley just south of the old Seppeltsfield winery, with plantings of Syrah, Merlot and Mourvèdre spread over terra rossa and deep alluvial schist. With 400 breeding ewes and at times 500 young lambs running around it can be hard to track down a sheep dog willing to leave the cool of the cellar to round up some unwilling sheep. But by the end of Summer the young lambs have left the farm and the grapes are getting ready to harvest. Syrah comes first, closely followed by Merlot and then our spicy Mourvèdre as we move deeper and deeper into Autumn. In Winter, pruning comes and goes and we spend a few days with the boys from the hills making sausages and smallgoods. As we move back towards Spring the pitter-patter of young hooves is back in the vineyard along with that ever-present lost little lamb who has fallen asleep in the afternoon sun and awakened to find no one to be seen.” Tom Shobbrook.